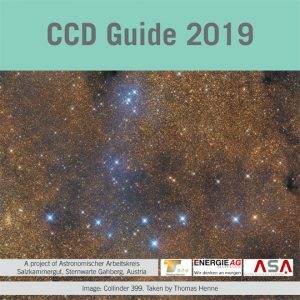 Every year since 1997, the Astronomischer Arbeitskreis Salzkammergut astronomy club in Austria has published the CCD-Guide in DVD format, which assists astrophotographers in planning their imaging projects. Besides a huge number of reference images, the CCD-Guide contains software to find images, to view images and to obtain all necessary data. The newest release contains more than 5,000 reference images from 52 astrophotographers. A special highlight of CCD Guide 2019 is the new powerful planning tool ObjectTracker, which quickly and easily answers the question of whether a particular object can be photographed at a selected location on a particular night. The ideal time window for taking photographs is calculated by taking into account twilight, moon, object altitude and optional horizon. The altitude progression of the object and of the moon is displayed in an intuitive graphic. – Minimal system requirements: CCD-Guide is executable on all current Windows PCs (starting with Windows 7) without installation. CCD-Guide team members work voluntary and all income is used exclusively to cover production costs or to support projects of the Astronomischer Arbeitskreis Salzkammergut astronomy club. You can order the CCD-Guide 2019 at a price of 29 € + postage. All users of older CCD-Guide versions can buy an update for the new release 2018 at a price of 19 € + postage.